The 1980s saw the rise of the music video clip – and Tina Turner followed the rule: every single release needed a video. So, no wonder that we can enjoy “three plus one and another one” video clips from the “Private Dancer” album. So, five clips in total but why the strange bookkeeping? Follow us back to 1984 and throw in either a video cassette or a Laser Disc. The video was shot in the “Rivoli Ballroom” in London which is still intact, dates back from 1913, and is famous for its 1950s ballroom charm. If these walls could talk…not only Tina Turner but also Oasis, Kate Moss or Elton John used it for filming and photo sessions. We see how the private dancer girl/woman prepares herself for work on the dance floor and then walks out in the hall where she firstly encounters apparently the owner of the ballroom who shows her unfriendly the way through the door to the ballroom and then secondly, a customer with whom she dances one number. The main part of the video, however, is a dream-like elaborated ballad/dance scene with fairy-tale elements. Dance is shown here as an art and not as a profane job on the edge of prostitution. . The private dancer girl suddenly awakes from her dreams and walks away from her customer with tears in her eyes. There are two different videos for “What´s Love Got To Do With It” but only the New York/color version was released on video cassette back then. The black-and-white version appeared later in 1991 on the “Simply The Best” video cassette/Laser Disc. Both videos feature segments from the same taping where she sings in a close-up scene. But the segments between those close-ups differ heavily. The standard version follows Tina across New York/Manhattan where she encounters diverse other people in the street and where we can see her interact with some of them either for dancing or even for settling a couple´s argument. The outfit in the standard version is remarkable and made it also to a stage outfit during the “Private Dancer Tour”: a black leather dress combined with a blue jeans jacket. Her legs are featured prominently throughout the whole clip as we see her walking or standing legs in various close-ups. The black-and-white version presents scenes from a nightclub or bar where boys/men indeed meet girls/women as it is told in the song. They meet either for the first time or on a date. Tina also visits that bar and witnesses all kinds of emotional scenes on the dance floor, at the bar or at the tables. We see couples love and differ, the sweetness and the poison of love among all ages and classes. This video is the traditional filmed live concert or show scene at a fictitious club called “The Beverly”. But it also includes a small story because a man (Cy Curnin of The Fixx, the same group of the guitarist in the video: Jamie West-Oram) follows her on stage, dances with her, until she pushes him back with the words “Why can’t you be good to me?”. Not a very sensational concept for a video clip but always good for promoting a tour. This video focuses firstly completely on Tina Turner herself while she is standing in a single nearly golden spotlight singing the first lines of the song and being filmed from all perspectives. She is then later joined on a red stage by her regular dancers Anne Behringer and LeJeune Richardson. The video is plain and simple with Tina and the two dancers singing and dancing in front of a black and a red/hell-style background. But then we even see the famous scene which caused rumors about Tina being lesbian because both dancers kneel down beside her and caress her legs. The same pose was then used for the single LP release and is indeed even today a bit unusual – not necessarily disturbing but still remarkable. The “Help” video was neither included in the 1984 video cassette nor in the 1991/94 Laser Disc/VideoCD collection of video clips which made it indeed quite rare, comparable to the “Overnight Sensation” video clip from 1987. 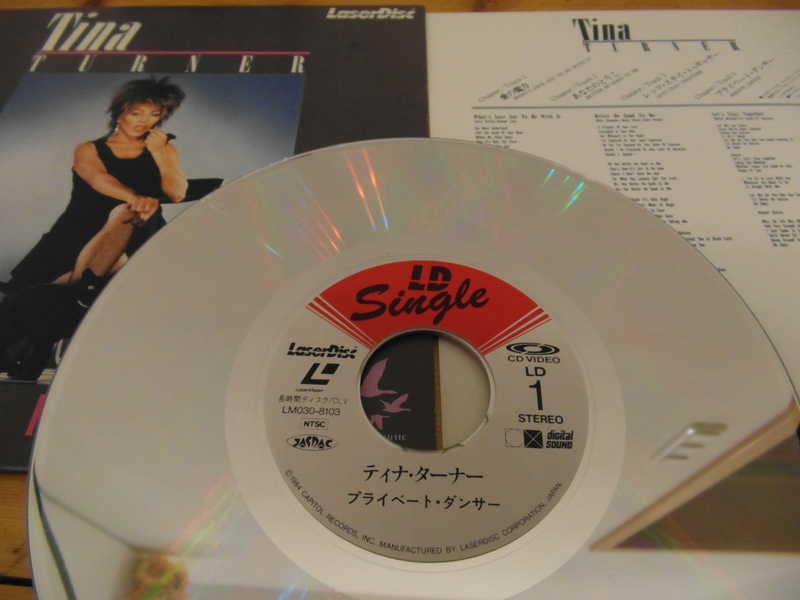 It again is pretty simple and similar to “Let´s Stay Together” as we see Tina perform the song on a stage in front of a nearly black background – only decorated by three huge arches of light bulbs. Tina you will always be simply the best in my heart! Thanks for the video memories guys. These are some of my favorite music videos of Tina. Sure, they got more expensive over the years but I always felt these went with Tina perfectly. I’ve always loved when she interacts with others even if they are more in the background. Thanks for the trip down rockin’ memory lane. I never knew about a “Help” video clip! It’s one of my favorite tracks off of the album. Hopefully it will be included in the audio/visual section of the P.D. Box Set. So, I’m guessing that since the official 30th Anniversary of this Classic LP has gone by without a word from anyone, the hopefully-forthcoming CD/DVD Box Set will be coming later this Summer…or in late Fall for the 2014 Holiday Season? P.S. Love the Laser Disc reproductions! Those were fun things to have in the early-to-mid 1980s. I hope the Japanese mini-LP SHM-CD reproductions look just like that in the (near?) future. For “Private Dancer” they published two video clips, which differ in the length. A long version with 5:25 and an edited version with 4:23. The shorter version is available on the “Simply The Best” video collection. What’s about the live videos for “I Can’t Stand The Rain” and “Show Some Respect”? Both were taken from the Birmingham concert and released on the “Private Dancer Tour” video. Fortunately, I recently got the complete “Help” video on an old VHS video tape called “Now – That’s What I Call Music”. I love this very simple clip because Tina looks amazing in it. I still haven’t been able to see either the extended version of the “Private Dancer” video, or the “Help” one, since it’s not allowed to view in America. Is there a “Private Dancer Tour” coming in 2015?